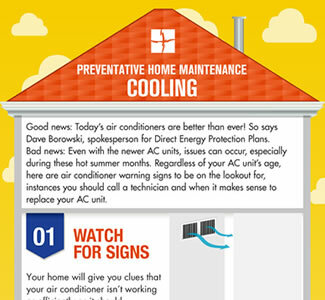 Are You Prepared for Air Conditioning Breakdowns? An air conditioning breakdown in the heat of summer is one of the worst possible surprises. Besides the discomfort, there are the repair bills – and AC repair costs are rarely covered by homeowners insurance. Are you financially braced for a breakdown? Regular maintenance can stave off disaster by detecting and correcting potential problems before your air conditioner fails. Annual AC tune-ups can also help you save money by maximizing the lifespan and efficiency of your system. Deteriorating efficiency results in rising energy bills, and these costs add up over time. Ducts: A good air conditioner can't make up for bad ductwork. If ducts aren't properly sized or sealed, treated air can leak outside and humid, dirty air can get sucked inside. Old, brittle duct tape, shoddy installation or dirty ducts can all affect performance and lead to breakdowns. Thermostat: Thermostats have a seven to 10 year lifespan and are susceptible to surge damage. When a thermostat becomes inaccurate or unreliable, it should be replaced immediately. New smart thermostats offer unprecedented features like smartphone control and advanced energy-saving technology. Condenser fan and coils: Air conditioners work by condenser coils absorbing heat indoors and fans expelling it outdoors. Coils must be clean to absorb heat effectively, and fans must be spinning at full speed to push that heat out. If you have a problem in either area, AC performance will be poor and greater damage may occur. TXV: The thermal expansion valve (TXV) inside your AC modulates the amount of refrigerant passing through the system and optimizing system performance. If it's not working right, performance drops and your energy bills rise. A seasonal tune-up ensures your entire system is performing optimally. A maintenance and repair protection plan can help you keep your air conditioner in good working order and protect you from sudden,unexpected repair expenses. Browse our cooling protection plansor call us at 1-888-733-1683 for more information.